Bute, Port Bannatyne, Kyles of Bute, Hydropathic. 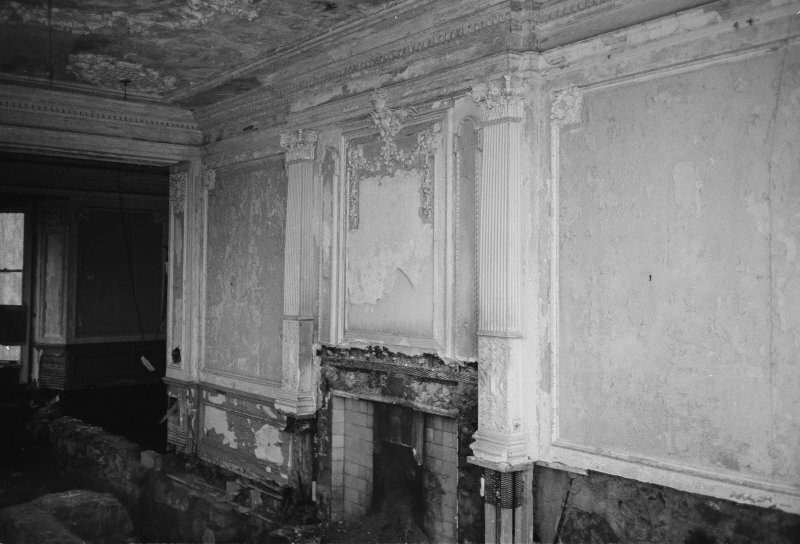 Central Block, North Spur, Ground Floor, North Room from North-West. Port Bannatyne North Bute, Bute, Scotland. Oblique aerial photograph taken facing South. This image was marked by AeroPictorial Ltd for photo editing. 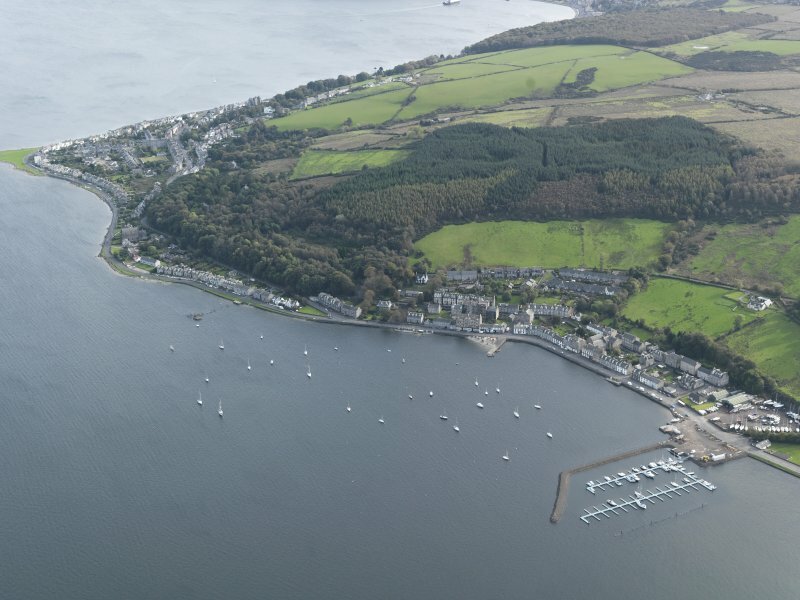 Bute, Port Bannatyne, Kyles of Bute, Hydropathic. 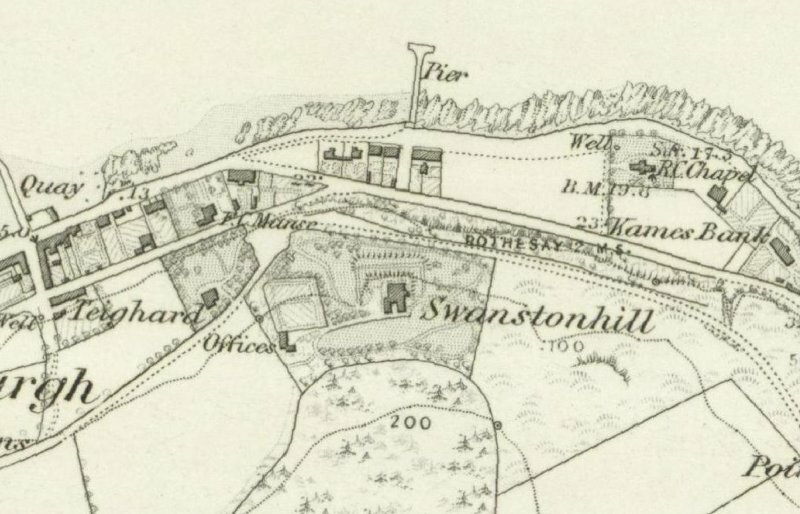 Distant view from N-N-W.
Swanstonhill, extract from 1869 6-inch OS map. 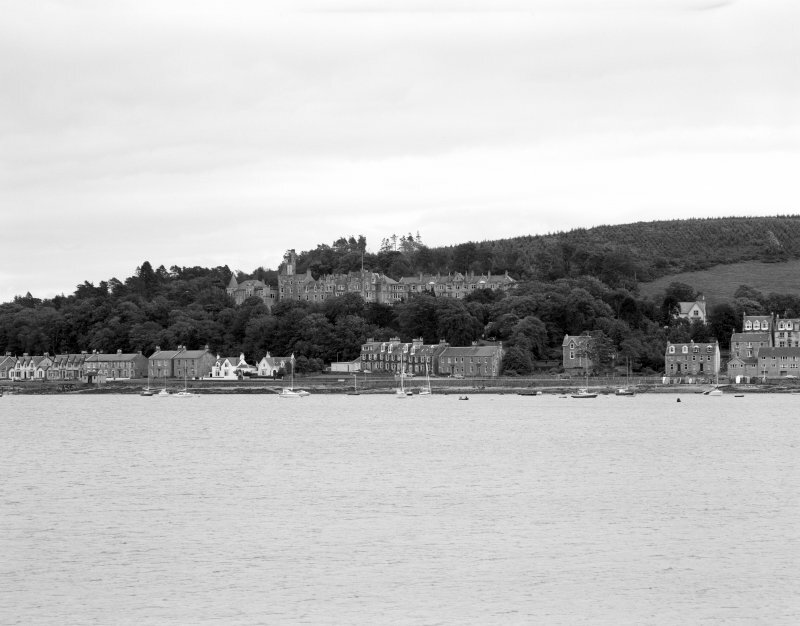 Bute, Port Bannatyne, Kyles of Bute, Hydropathic. West wing. View from N-N-E.
Bute, Port Bannatyne, Kyles of Bute, Hydropathic. Rear (South) of building. Central and East Blocks. 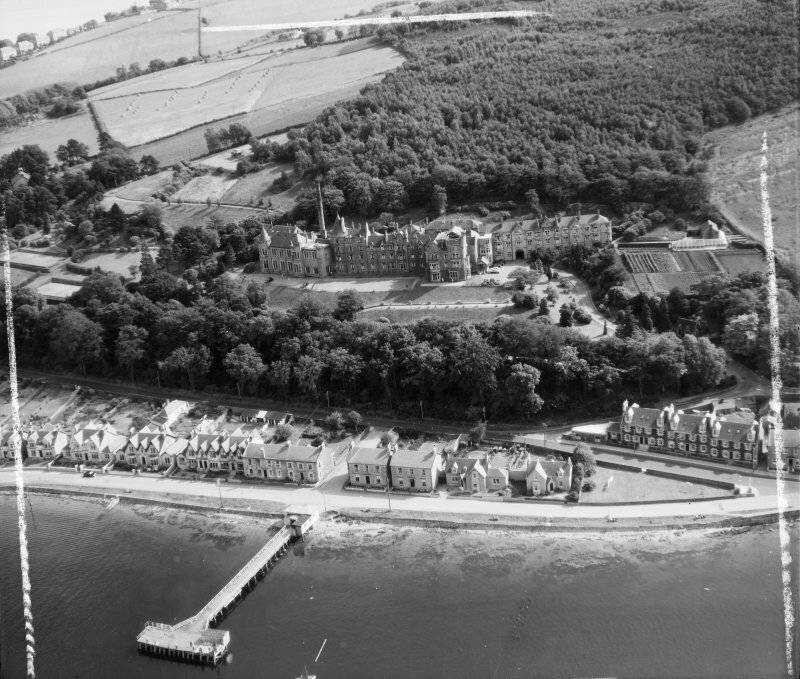 Bute, Port Bannatyne, Kyles of Bute, Hydropathic. Main Staircase, at junction of East Block and Central Block. Swanstonhill was a Victorian house designed by John Thomas Rochead (1814-1878) and built on a terrace on the hillside above Port Bannatyne about 1855 for a Mr John Smith. A long wing, designed by John Honeyman (1831-1914) (Dictionary of Scottish Architects), was added to the W side of the house when it was converted to an hydropathic hotel, which opened as the ‘Kyles of Bute Hydro’ in June 1879 (Daily Express, June 11, 1879). A wing was added to the E side of the original house about 1911 as part of the scheme of rebuilding after a fire in 1909. 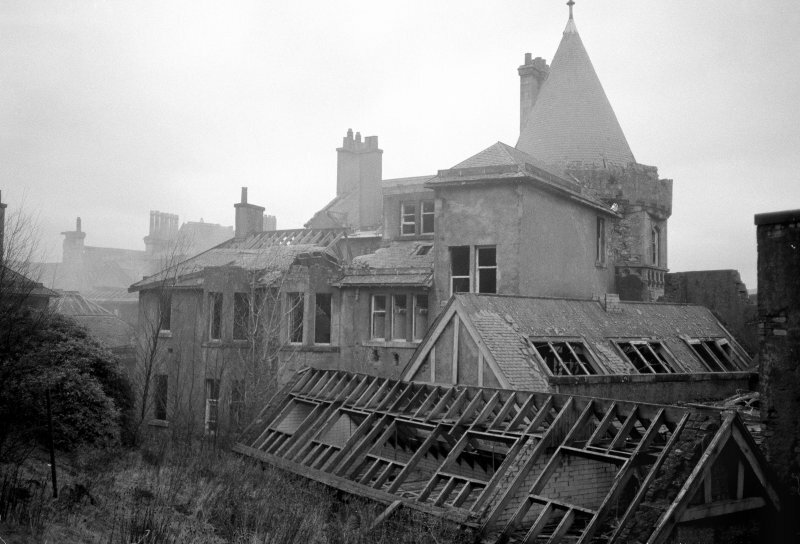 All that is now visible of the whole building is the landscaped terrace on which it was constructed and a large spread of demolition debris that is gradually being obscured by regenerating woodland. The original Victorian house and its policies, which contained outbuildings (NS06NE 57.01) 90m to the WSW of the house, a gate-lodge (NS06NE 57.02) 90m to the WNW, and a garden, are depicted on the 1st edition of the OS 6-inch map in 1869 (Argyllshire and Buteshire 1869, Sheet CXCIV). The contemporary OS Name Book (No. 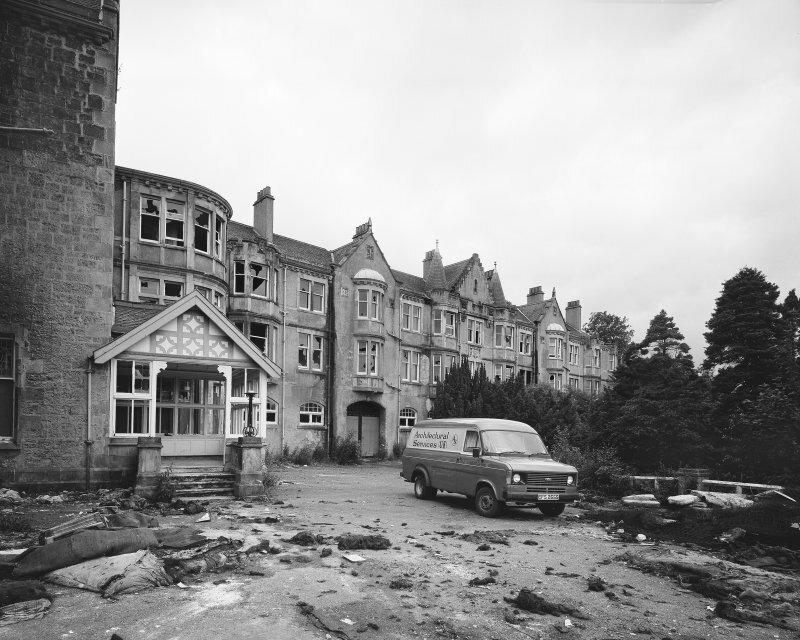 83, p.36) describes Swanstonhill as 'a very handsome cottage surrounded by ornamental ground and gardens feud off the estate of Kames, the property of James Smith Esquire.’. The 2nd edition of the OS 25-inch map (Buteshire 1897, Sheet CXCIV.14) shows the hydropathic hotel, the lodge and the outbuildings, but it also depicts a large glasshouse at the SW corner of the garden, the dwarf walls of which are still visible. 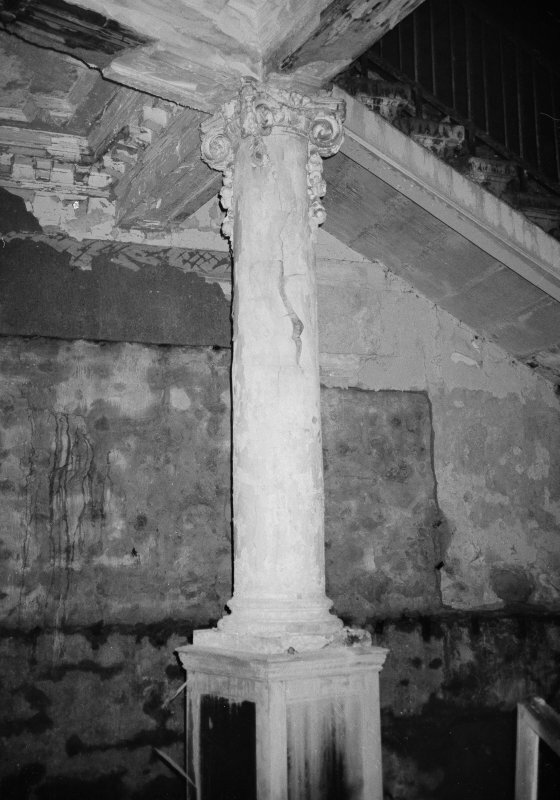 The outbuildings, which probably incorporated a stable, coach-house and accommodation for servants, are now no more than ruinous shells which were not recorded in detail on the date of visit. The gate-lodge has recently been reduced to a heap of rubble, though the lower courses of its walls remain intact. Two gate-piers flank the entrance to the former drive immediately N of the lodge. Visited by RCAHMS (GFG, JRS) 2 June 2009.